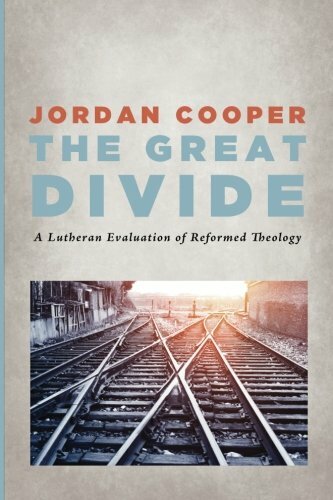 I recently received a review copy of Jordan Cooper's The Great Divide: A Lutheran Evaluation of Reformed Theology. I count Cooper as a friend and appreciate his effort to make clear the real differences between the Reformed and Lutheran tradition. This too is a decided interest of mine. I hope to interact with Cooper with that sole purpose in mind. I will be decisively less interested in presenting my arguments than Cooper. But I do hope to encourage some Reformed thinking. That said, I confess that I am rather unqualified for the task. Not because of any lack of knowledge, but rather because my own view of Reformed Theology is heavily influenced by encounters from the Reformed fringe (on this subject I would recommend Oliver Crisp's Deviant Calvinism). I tend to be more ecumenical in what constitutes Reformed Theology and Cooper's TULIP based approach keeps certain articulations in limbo. This leads to wavering agreement and disagreement with Cooper — which is sure to be at times confusing. In this blog series, I hope to highlight things that particularly interest me and not all my quibbles over Cooper's presentation of Reformed Theology. I will begin today with some points from his first chapter on predestination. While discussing Total Depravity (9-12), Cooper points out that the traditional Calvinist understanding of "free will" was dramatically altered under the watch of Jonathan Edwards. Up until that point, the negation of free will had been applied almost exclusively to the subject of conversion or reorientation of a sinner to God. Cooper does a fine job introducing the thoughtful change that Edwards brought to the table by relying on philosophical determinism (rather than Scripture) to all but eliminate any traces of free will in humans. This is something that I have been familiar with for awhile since reading Kenneth Keathley's Salvation and Sovereignty. The Determinism of Edwards has had a huge impact on modern Calvinism through the ministry of New Calvinists such as John Piper. I bring the subject up here because Edwardianism is often passed, or assumed, as true Calvinism today. In fact, I know many Calvinists who simply adopted Calvinism because they are determinists. It should be seen from the outset that this is against the Reformed confessions and makes for a rather large stumbling block when talking with Lutherans or non-believers. While discussing the varying lapsarian of the Reformed tradition, Cooper correctly points out that the majority consensus in the Reformed Tradition unintentionally puts election at the center of soteriology instead of the incarnation, atonement, or some combination of the two. It is this emphasis that leads to the Reformed distinction between the hidden and general call unto salvation. The hidden call brings forth regeneration while the general call is the global offer of the Scripture. Or more essentially, "saving grace" cannot be given or genuinely offered to the non-elect because it was not merited for them on the cross. Or in Cooper's language "the cross...become[s] a means to bring about election." From the fringes of the Reformed Tradition, Karl Barth also had concerns about the placement of election. He, like the Lutheran position explained by Cooper, sought to make the person of Jesus Christ the center of soteriology. Barth being Reformed attempted to do this through a unique understanding of election that I do not have the time to explain here. Both Barth and Cooper seek to establish how the Biblical God can truly be God-for-us in light of unconditional election. For on the surface of the Reformed Tradition, God can only be God-for-some. I do not think it is the Reformed perspective on election that causes this problem. It is the persistent habit of reading redemptive history through an election that we are not privy to know. This practice often leads to Reformed speech that cannot exist apart from election. Election becomes the core soteriological block from which people can speak confessionally. The Westminster Confession, for instance, speaks almost exclusively from the perspective of election. And yet, this is a hidden election. I would suggest the Reformed world discuss this subject more, but the continuing flap over the Federal Vision is likely to keep that from happening. In contrast to the Lutheran articulation of single predestination, the Reformed tradition in every case supports "double predestination." The Lutheran position is very similar to the Reformed on election unto salvation. In fact, Cooper's language in support of single election will sound very familiar to many Reformed perspectives. The breaking point with the Lutheran view seems to be the reprobate being denied "saving grace." This is the key distinction between the views on the issue of those left to reprobation. The Lutheran view on the nature of the atonement makes the reprobate able to receive saving grace and reject it. The distinction is made. I will address with the atonement (chapter 2) in my next post. When Cooper pronounces the position of "double predestination" to be unBiblical, the natural response from Reformed readers will be to turn to Romans 9. Cooper provides a decent exposition while acknowledging that something longer is probably needed — here's looking at you Lutheran seminary students. Reformed arguments hinging on Romans 9:22 are unlikely to be very persuasive. Especially in light of the Reformed Tradition's lack of interest in Romans 11:32. While I too do not have the time to do a thorough response to Cooper's analysis of either reading, I will take the opportunity to compound the issue and state disagreement. In Election of the Lesser Son by David Wallace, Romans 9-11 is exposited as Pauline Midrash. Wallace argues that Paul sees the election of the "lesser son" as a means of providing redemption to the "older son." This argument has a stirring ability to tie together Paul's discourse on Jews and Gentiles across Romans. It helps explain how Romans 11:32 speaks to the Jew-Gentile distinction established in Romans 3:9. My disagreement comes with Cooper's discussion of Pharaoh in Romans 9. While I certainly do not see Romans 9:22 as a definitive text on predestination to damnation, I also think Cooper sells the Lutheran position too high — his conclusion being, "Pharaoh's hardening is a result of his own sin rather than being predestined unto death" (24). Cooper argues this because of the alternating narrative of God hardening and Pharaoh hardening. There is certainly a relationship between God's activity and Pharaoh's activity. However, this is not a refutation of God's predestination. In fact, before Moses even enters Egypt, God takes all responsibility for hardening Pharoah's heart (Exo. 4:21). This is not the narrative of Cooper's argument. This is a direct communication from God that He was responsible for the hardening. The Reformed would say that this hardening works itself out through "liberty [and] contingency of second causes" (WCF III.I). "That many who have been called through the gospel do not repent or believe in Christ but perish in unbelief is not because the sacrifice of Christ offered on the cross is deficient or insufficient, but because they themselves are at fault." I agree with Cooper that there are real, substantial differences here between the two traditions. But I am not sold on the reasons for rejecting the Reformed position nor the accuracy of the differences. I am growing to see the extent of the atonement as the primary source of disagreement between the two groups. So I will touch on this in my next post.